Requirements Management is now a first-class citizen in the Eclipse world. You can get started authoring requirements using the ProR Tool. RMF is a framework for working with textual requirements, structured as ReqIF models, the industry standard for exchanging requirements. RMF uses natively ReqIF, the open standard for requirements exchange, allowing you to exchange requirements with many industry applications like Rational DOORS® or PTC integrity®. ProR is the GUI that allows comfortable working with Requirements. It opens ReqIF files with a click, allowing you to immediately inspect and edit files. Powerful extensions exist for dealing with rich text, ReqIFz-Archives, and much more. ProR is designed explicitly for integration and extendability. An Extension Point exists that allows tools to integrate their own renderer or even editor. Some integrations are publicly available, including a UML/SysML integration and an integration with the formal modeling tool Rodin. If you are just looking for a Requirements or ReqIF-Editor, just download formalmind Studio and start being productive. 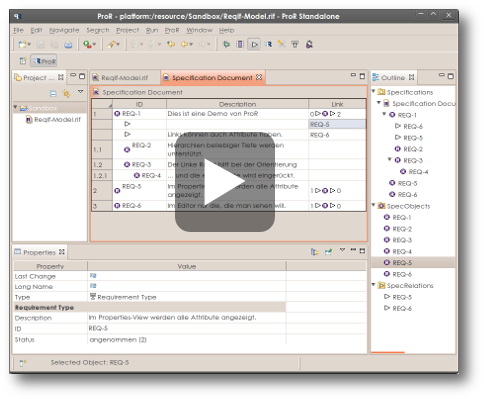 Formal Mind Studio is a third-party, stand-alone build of ProR with enhancements. Alternatively, you can install ProR into any Eclipse-Installation (3.6 and later) by using the update site URL provided on the Download Page. RMF became an Eclipse project in November 2011 (Initial Proposal). As it is still developing at a rapid pace with some parts of the API still changing, it is still in incubation. Nevetheless, the data model is stable (as it is based on the OMG ReqIF standard), and it is already used in production environments. The Requirements Interchange Format (ReqIF) is an OMG Standard for exchaning requirements. ProR supports Version 1.0.1 and 1.1 (which are binary compatible), while code for handling RIF 1.1 and 1.2 is part of the RMF Core. ProR is used by the ProSTEP Implementor Forum for testing the various ReqIF implementations. 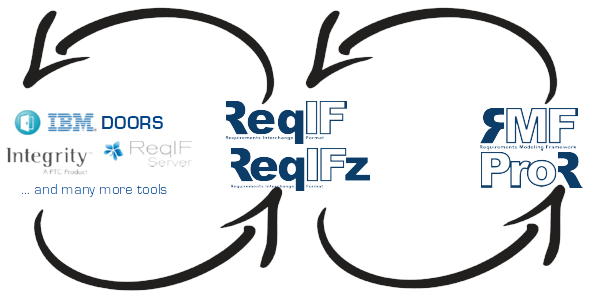 RMF provides a rich API to work with ReqIF models. ProR provides extension points, allowing the use of alternative renderers and behavior. Therefore, providing a seamless integration with other Eclipse tools and EMF models is comparably easy. This has been demonstrated in the FP7 research project Deploy. A collection of useful utilities called ProR Essentials is available for free and allows, amongst other things, the correct rendering and editing of rich text (xhtml), handling of ReqIF archives (.reqifz) and more. Note that these are third-party extensions that are not part of Eclipse. The third-party formalmind Studio already comes with Essentials installed. Download formalmind Studio - The fastest way to get started is to download formalmind Studio, which is a third-party distribution that extends ProR with useful enhancements. Alternatively, you can use the binaries on the download page. File a Bug - Think you found a problem? You have a feature request? Then file an issue in Bugzilla. You need an account to file bugs. The following collection of links will hopefully help you find quickly what you are looking for. Contributor Guide - This Wiki page contains everything to get started. Project Page - Contains Statistics, Repositry links, Committer Information, etc. Extend ProR - To extend the functionality of ProR, you can create so-called presentations. which are plug-ins that provide custom renderers and other extensions. eclipse.org © 2014 All rights reserved.